I saw a lot of exhibitions this past few weeks, and I must say that despite my interest and the obvious merit of some of them, I found it hard to “review” these shows. I’m certainly not a critic, and one of the most important lesson Sotheby’s taught me this summer was that there isn’t only one way to see an exhibition, all our impressions and feelings toward a piece of art are as valuable than any one else’s point of view. Who never fears to give his/her opinion on an exhibition? The silly fear of saying something wrong even stupid. Guess what, there is no such a thing that giving an inaccurate answer. Sometimes when I read the pompous press releases of some exhibitions, I’m not even certain that the curator him/herself understand what he/she is talking about. They drown their subject in a sea of fancy words, pretentious allegories and pseudo philosophical references, and make complicated something extremely simple. 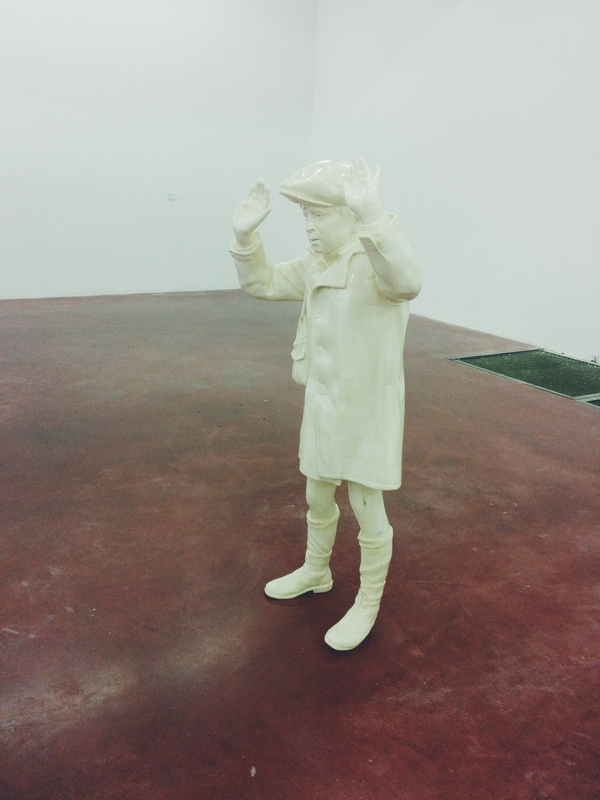 So I decided that I will use simplicity to tell you about “Mon Enfant“, an exhibition by Franco-Algerian artist Adel Abdessemed currently showing at the renowned Dvir Gallery in Tel Aviv. Before heading to the show I only knew two things about Abdessemed : that the business man and art collector François Pinault is one of his fervent admirer, and about the polemic around his piece “Don’t trust me” that was showing animals getting violently kill, making the artist a target for animal activists. I was expecting to see the art of a provocateur, of a bombastic artist who likes to disturb his audience by showing the ugliness and the violence of our contemporary society through frightening pieces, a bit like the Chapman’s brothers. 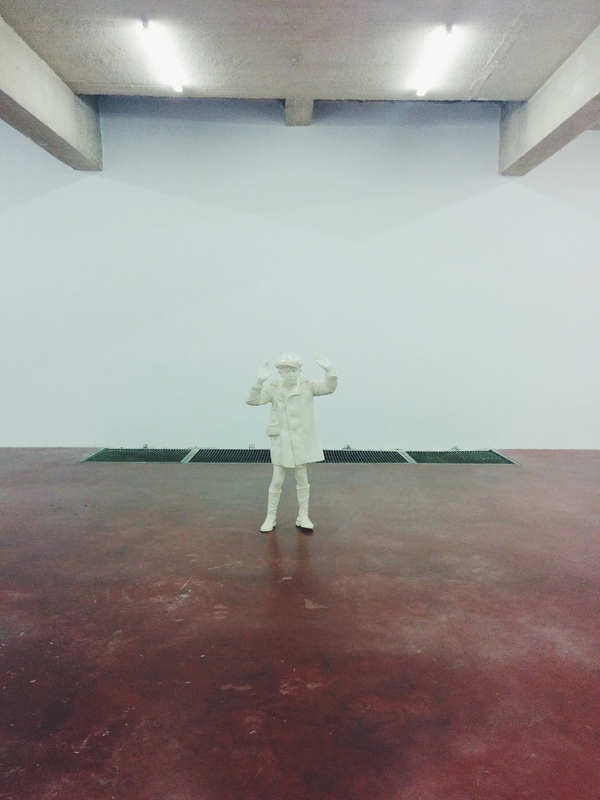 But instead I was pleasantly surprised to see a very sober-minded exhibition. 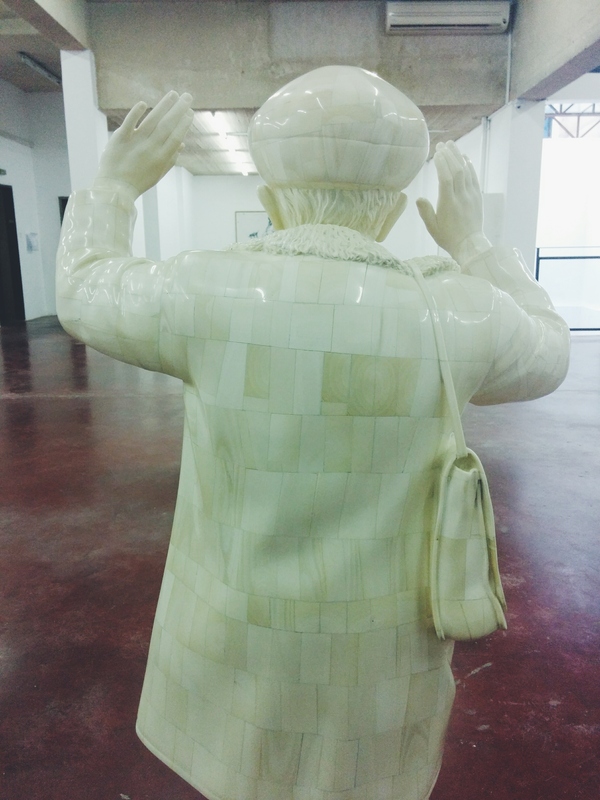 The show is display on three different floors, we first entered the second one where despite the huge size of the room we could only see one thing: an extremely powerful figure of a child made with ivory. 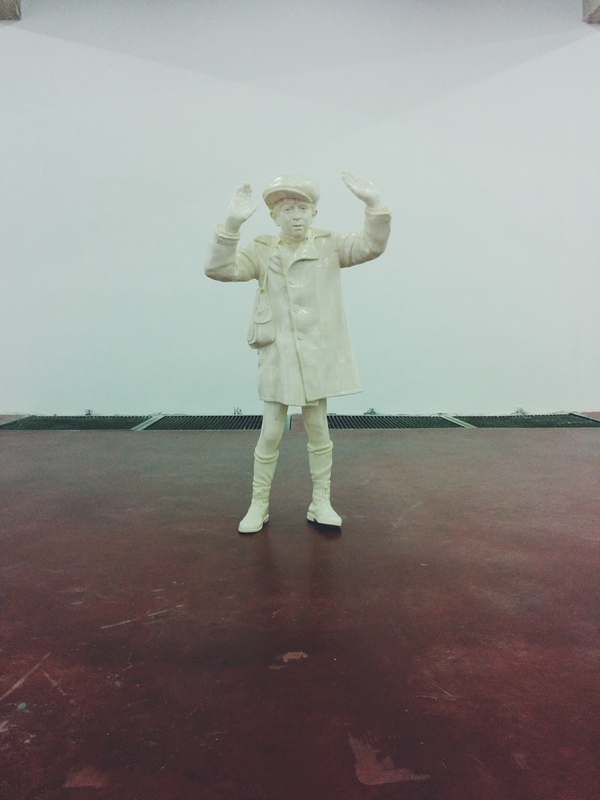 With his hands up, in an attempt to stop his interlocutor from hurting him or to claim his innocence, he looks scared and lonely. There is something very violent about this scene. His energy is sucking the entire room, I barely noticed the drawings displayed all around representing a dog carrying a human hand in his mouth. All my attention is on the child, the title of the show makes suddenly sense “My Child“, is he Abdessemed’s child? Is he everyone child? I can’t help it to notice the old fashion clothes he is wearing, and wondering from which time this kid is coming. Later on while reading the press release, I learn that the artist was inspired by the image of a child from the Warsaw ghetto before his execution, but also by Paul Klee “Angelus Novus“. The expression of his face will haunted the rest of our visit. 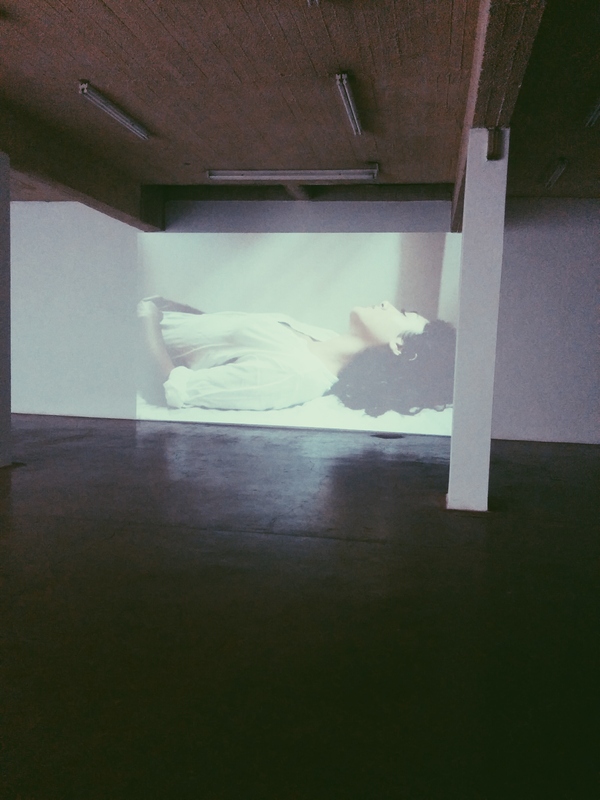 On the first floor, a video called “Solitude”-loneliness is projected. It strangely echoed the loneliness of the child upstair. 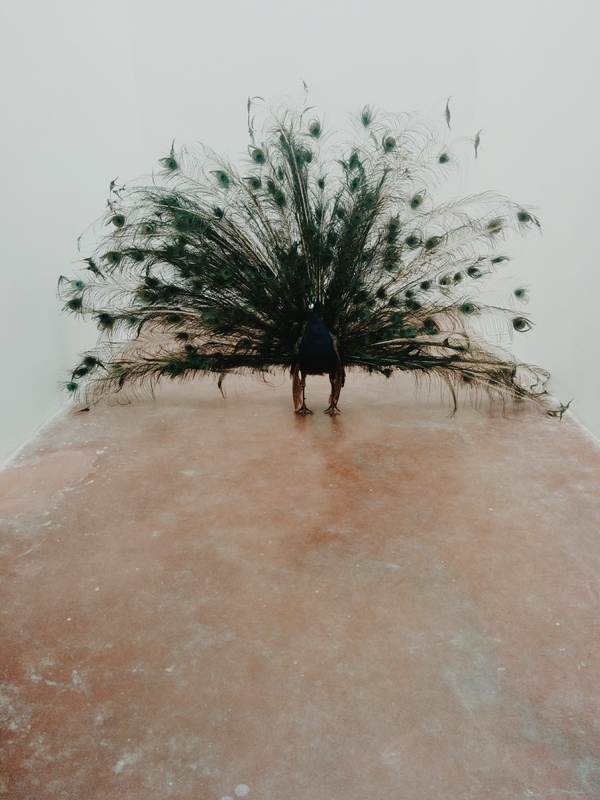 In a corner, under a shaft of natural light there is taxidermied peacock named “Alexandre” carrying an egg in its mouth recalling the dog holding the human hand in his fangs. The bird is surely majestic, it reminds me a poem of Jaques Prévert and makes me wonder what is Abdessemed’s obsession with dead animals. After climbing the stairs we finally end up on the third floor in a dark room. 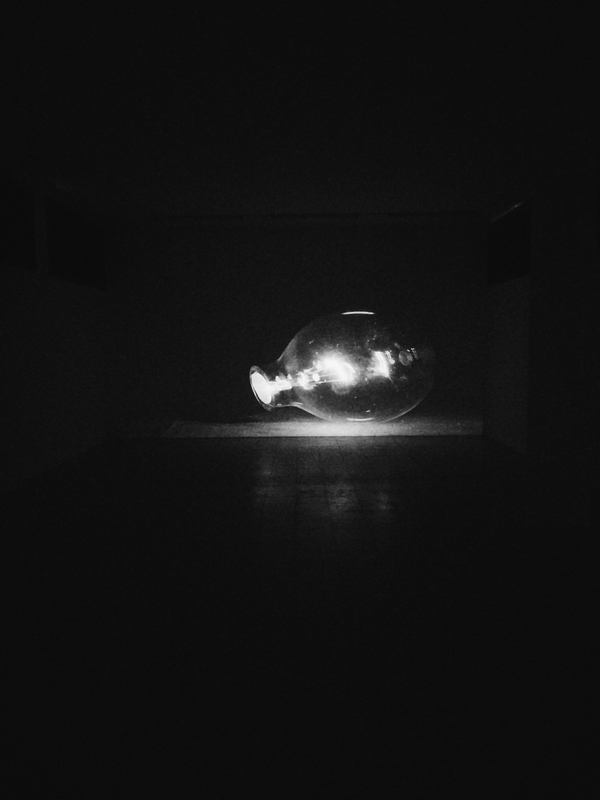 “Nuance” a video of a light bulb is projected. The sound disturbs me, but I found myself being quiet absorbed by the scene. We are still thinking about the ivory child.